A new Neighborhood Impact Investment Fund of $80 Million is now available to you. If you’re investing in real estate or even thinking about it, come and take advantage of this huge opportunity! Take advantage of FREE money for your next deal. If you haven’t been to a MD REIA meeting, then find out about Maryland’s longest-running real estate investors association. Come learn, network, and have fun with a great group of people just like you! Join the MDREIA for a full year and network with other real estate investors, while learning about the business through monthly investor seminars. membership is only $150 for the year and includes: Networking, monthly meetings, preferred pricing on special events, discounts from our vendor list, early access to auction properties and much much more! Access a $52 Million Neighborhood Investment Fund available for your investments in Baltimore City Opportunity Zones. No prior knowledge of real estate investing is necessary to participate in MDREIA meetings, buyers, sellers, and agents can all benefit from techniques demonstrated in our discussions. We encourage attendees to bring specific examples of real estate investment challenges, so that we can discuss them with the group and offer possible solutions. Remember to get to the meeting in time for the Quick Pitch, so you can hear – and present – any deals, services, or investment opportunities. If you pitch a property to our investors during the Quick Pitch, a brief description of the property and your contact information will be posted to our web site for the rest of the month. Insist on IURealist - Real Estate Data Exclusively for Investors. Only $39 a month. IURealist.com is the most comprehensive online support system available to any real estate investor. Designed exclusively for Investors United School of Real Estate Investing, IURealist.com equips you with a nation-wide real property database mapping and analysis system. IURealist.com helps you create opportunities for profit by giving you greater control of more information than any other real estate investment service. No prior knowledge of real estate investing is necessary to participate in MDREIA meetings, and buyers, sellers, and agents can all benefit from techniques demonstrated in our discussions. We encourage attendees to bring specific examples of real estate investment challenges, so that we can discuss them with the group and offer possible solutions. Remember to get to the meeting in time for the Quick Pitch, so you can hear – and present – any deals, services, or investment opportunities. If you pitch a property to our investors during the Quick Pitch, a brief description of the property and your contact information will be posted to our web site for the rest of the month. Our goal is to add the title of the BEST real estate investing club to our current title of the LONGEST RUNNING one in the nation. In order to do this we need to spend more time and resources. And yes, all that takes money. But, we have big plans for 2016. We have created a new website that will be a portal to a number of new resources and events for our members. What are the resources and events that you plan to add? We are creating a members only area where you will be able to network with each other and post questions and classifieds. Additionally, we are adding webinars, articles, interviews, audio content and videos. Do I have to pay for special events? There will be a member discount to special events, and some will be free. Can I come to a meeting or event if I'm not a member? Yes! Non-members can come to regular meetings for $25 at the door. Special event prices will vary. Or join for the year for only $150—a savings of over $100! What is the MDREIA's relationship with Investors United? Both organizations were started by Charles Parrish over 30 years ago with the goal of networking and training real estate investing partners. Investors United hosts the MDREIA and the association benefits from IU’s resources. However they are quite different. 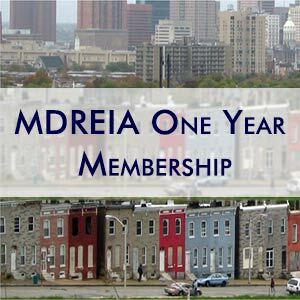 The MDREIA is a traditional real estate investing club, in that it has monthly networking meetings with a real estate investing presentation, and charges a small membership fee. So, the MDREIA is a great way to get started learning and networking with other investors and industry professionals. Investors United, on the other hand, is focused on creating the nation’s most knowledgeable and successful real estate investors/partners through a hands-on mentorship program that leverages 40 years of investing expertise. 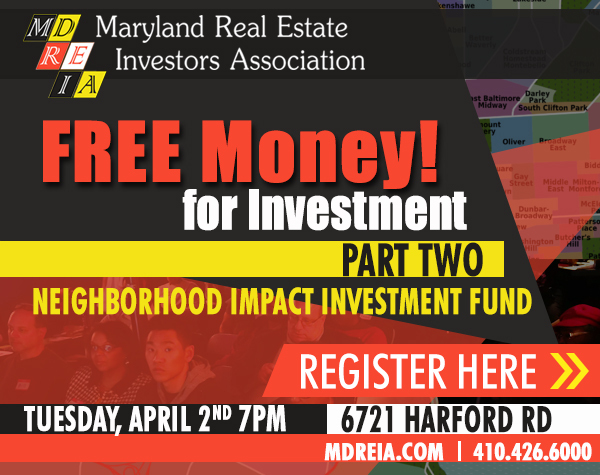 NETWORK • LEARN • INVEST AT THE MDREIA: Exchange events happen at Investors United School of Real Estate Investing. Take I-695 exit 31A, go two miles to 6721 Harford Rd., Baltimore, MD 21234. The MDREIA is on your left. Park in the Investors United lot, or use street parking. DIRECTIONS TO THE MDREIA: Exchange events happen at Investors United School of Real Estate Investing. Take I-695 exit 31A, go two miles to 6721 Harford Rd. on your left. Park in the Investors United lot, or use street parking.